When a parent rock is exposed to the atmosphere or when living things and/or minerals are deposited on the earth's surface. 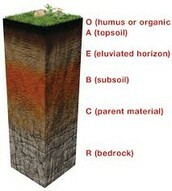 There are four main horizon(layers) of soil profile. 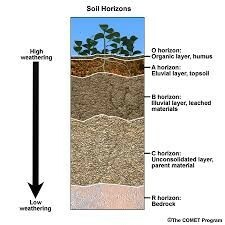 O Horizon- The top layer of soil that is made up of living and decomposed materials like leaves, plants and bugs.This layer is usually dark and thin. A Horizon- This is the layer that we call "topsoil".This layer is made up of minerals and decomosed organic material.Many plant roots grow here. B Horizon- This is the layer named "subsoil".It has clay and mineral deposits, aswell as less organic matter.It is a lighter color than the ones above it. C Horizon- This layer is called "regolith".It is made up of slightly unbroken rock and little organic material.Plant roots do not grow here. Not conservating soil is a huge pollution problem today. 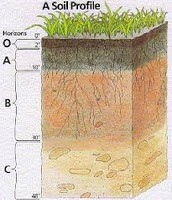 Soil Conservation- A method to maintain the fertility of the soil by protecting the soil from erosion and nutrient loss. Cover Crops- Crops that are planted between harvests to replace certain nutrients and prevent erosion. Countour Plowing- The rows of crops act as a series of dams instead of a series of rivers. 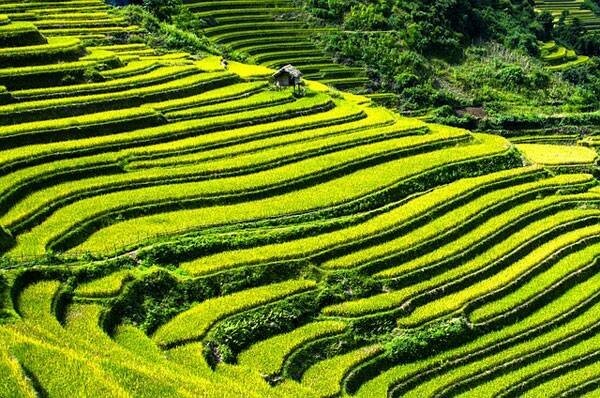 Terracing- Terracing changes one steep field into a series of smaller, flatter fields. No-Till Farming- It is the practice of leaving old stalks, which provides cover from the rain.